Curled up like a little child taking a nap, she seemed even smaller than her ninety pounds. She was clean, her hair in a tidy braid, her skin soft and moist, and she had no signs of skin breakdown or bed sores, the absence of which told us that her son clearly took time bathing her, using moisturizers, and frequently turning her to prevent prolonged pressure on any one area. Sometimes she would open her eyes but they did not register any recognition — even of her son, even when he called her name, Eva. Mostly now at 88 years of age, she just lay there all curled up, no longer able to uncurl, eyes closed. We could get no response from Eva unless she experienced pain. Turning her would sometimes bring a cry and trying to stretch her contracted limbs always brought one. She wore a diaper that was changed regularly by her son at home and by our staff when she was in the hospital. A few years earlier she would wake up and could be fed. That ability had slowly vanished and her son elected to having a feeding tube placed as her sole way to receive nutrition. He wanted to keep his mother alive as long as he could. Her diagnosis? Advanced and advancing dementia, a combination of Alzheimer’s and small strokes. Eva’s caregiver was her son, a man in his fifties who immigrated with her, leaving his position in their home country. His only income was the state support as his mother’s caregiver. Every few months Eva would develop some malady—a cough, a urine infection, or mysterious fevers. We would hospitalize her, noting that during her stays, her son rarely visited. This limited our ability to form a relationship, a partnership with this important person in Eva’s life, but we believed everyone needs a break. For that reason, his absence did not bother our interns and residents or me and the other faculty doctors. Usually after several days, we would pronounce Eva well enough for discharge and he would come and get her or be at home to receive her when the cabulance brought her home. When Eva’s condition progressed to the unresponsive curled up, unable to uncurl or respond being, we initiated a conversation with her son who had durable power of attorney for health matters. If her heart stopped, what would he want for her? What would she want? He was adamant that he wanted full resuscitation. We talked with him about how she was in the terminal stages of Alzheimer’s and asked him about the quality of her life. He remained firm: resuscitate her if she needed it. Medical futility is a situation when intervening is not likely to have a good outcome or to produce good quality for the person. There are easy examples: should a person with advanced lung cancer, with spread to other organs, be given an organ transplant? When we think about the rususcitate or not question, age and other medical conditions influence the predicatbility of success. For Eva, if her heart stopped, indicating she was basically trying to die, the likelihood of surviving a full resuscitation was less than 1%. And “codes” are brutal: ribs get broken, livers and spleens lacerated, lungs punctured. This is certainly not all the time, but the older and more frail a person is, it is more likely that it will result in what feels to us like torture and it is least likely that the person will survive. Some states allow a physician, with certain protocols to say it is medically futile. 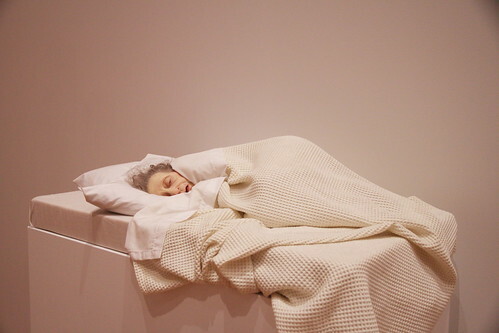 The image is a sculpture by Ron Mueck called Old Woman in Bed can be found here. This entry was posted in ethics, family, health care, health policy, social justice and tagged ethics, nablopomo, social justice on November 15, 2013 by sdobie. If you had already told him that it was “medically futile”…….you had done all you could. In the end, it was still up to him, unfair as that may be. Thank you. I appreciate hearing comments. PS I love architecture.